Nuremberg, Frankfurt, Leipzig, the author, son and heirs of J.A. 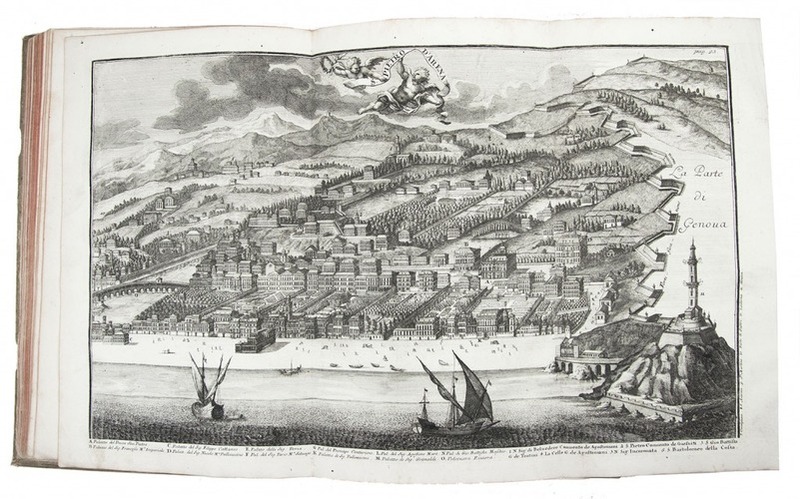 Endters, 1708-1714. 8 parts plus 6 appendices in 2 volumes. Folio. 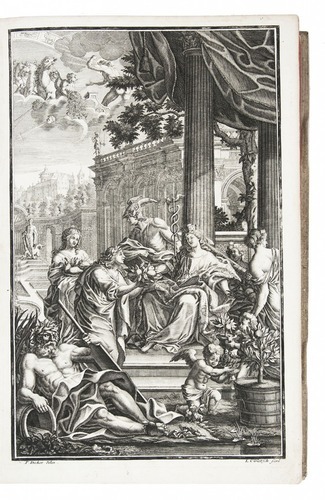 With 6 engraved allegorical frontispieces with garden scenes, 4 engraved part-titles, and 235 other engraved plates by the finest German artists and engravers (8 double-page & 13 larger folding). Contemporary richly blind-tooled pigskin over wooden boards. 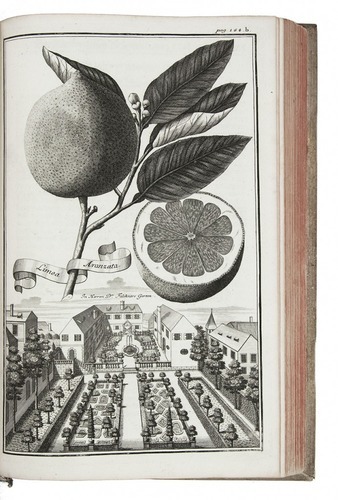 First edition, with astonishingly beautiful illustrations of citrus fruits, flowers, exotic plants, landscapes, cities, villages, palaces, gardens and garden art (including sundials and an obelisk with Egyptian hieroglyphs), as well as garden, building and city plans, labyrinths, etc. Most of the plates show a large illustration of a fruit (or less often a flower) above a small view of the garden, village, city or region where it is found, resulting in frequently surreal effects reminiscent of Roald Dahl's James and the Giant Peach. 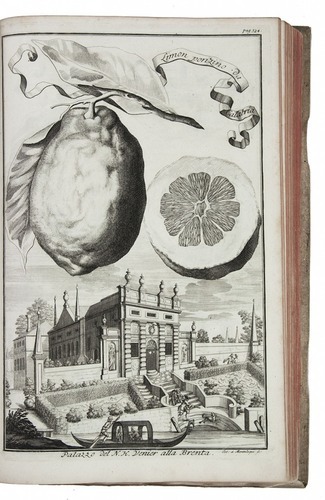 Many include people engaged in various activities, and some of the botanical illustrations also include insects, spiders, birds, etc., including pests that damage the fruits: "delightful views of the gardens and palaces of Germany, Austria and Italy" (Blunt); "engraving as fine as this is not really improved by colour" (Raphael); "the vignettes and tailpieces ... are so attractive that they have often been borrowed to decorate later books" (Raphael). Contemporary owner's inscription of Franciscus Josephus Jurziczeck on both title-pages. The total number of plates varies from copy to copy, but no copy appears to have more than 117 in vol. I and 134 in vol. II (including frontispieces and part-titles). 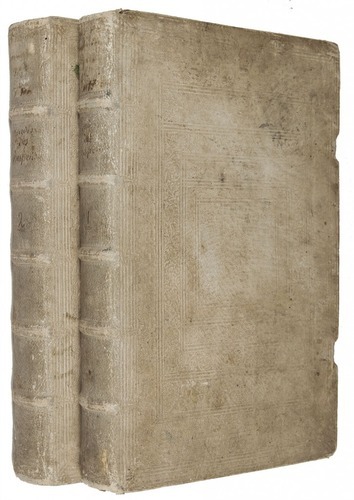 Lacks 5 plates, with two leaves browned, a tear slightly affecting 1 plate, and occasional minor spots or marginal water stains; fastenings of bindings lacking. Attractively bound copy. Blunt, p. 138; Dunthorne 323; GFB, p. 79; Hunt 420; Nissen 2076 & 2078; Raphael, An Oak Spring Pomona 73.